On the wild river that divides Namibia from Angola, members of the Himba tribe herd cattle as they have done for hundreds of years. But the world of the Himba sits in the shadow of third-world development and the inevitability of change that threatens their way of life; now, they are more likely to attend evangelical church services, congregate around the liquor trader’s truck, and pose for tourists’ photographs. 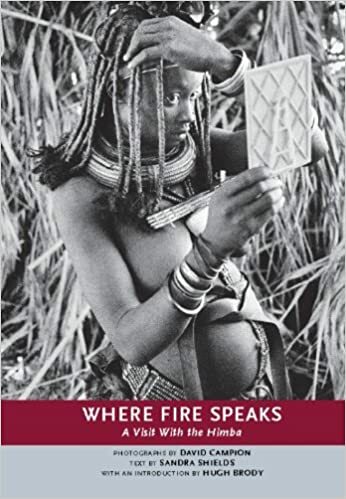 Sandra Shields and David Campion spent two months living with the Himba, and this book, a provocative melding of photography and narrative, tells of the profound changes in the lives of the Himba—both gradual and immediate—which echo those effecting indigenous people around the world. Includes more than one hundred black and white -photographs. David Campion and Sandra Shields met in South Africa, married a year later, and have collaborated for over a decade. Sandra has written for publications including Geist and The Globe and Mail, and David’s photographs have appeared in publications and exhibitions in Canada, Europe, and Africa. Parallax, a new series of books from Arsenal Pulp Press, explore the far reaches of the modern world, proposing new perspectives on how we see ourselves through the eyes and the words of our most intriguing photographers and writers. healer. My eyes went from the guts spread on the ground to the white line in the sky. It was probably a planeload of tourists on an African holiday. I thought about the people in the sky, the people on the ground, and the distance in between. The innards of the goat con>rmed that the man was cursed and told the healer 14 what must be done to undo the magic. The goat’s body was hung in the tree and we all followed the healer down to the dry stream bed where two goats were tethered in the bushes.